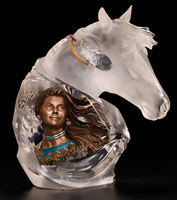 Horse Statues - Click on an item for more details! This Roman Horse Sculpture is individually bronze plated. Meticulously crafted by hand to ensure this piece is of exceptionally fine detail as well as lasting durability. Designed to add beauty to your home or office! Bronze Coated Poly-resin, 6 inches Wide x 7 inches Tall. 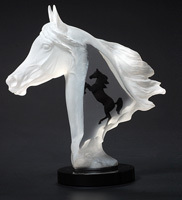 This "In Flight" Horse Sculpture is individually bronze plated. It is meticulously sculpted by hand to ensure this piece is of exceptionally fine detail as well as lasting durability to add beauty to your home or office. Bronze Coated Polyresin, 15 inches Wide x 13 inches Tall. This “God Father” Horse Head Sculpture is individually bronze plated. The sculpture is meticulously crafted by hand ensuring this piece is of exceptionally fine detail as well as lasting durability. Designed to add beauty to your home or office. Bronze Coated Poly-resin, 17 inches Tall. This "The Stallion" Sculpture is handcrafted of bronze with the highest quality and innovative design in mind and represent a unique value while beautifying any room at home or in the office. Bronze, 28.5 inches H. x 31 inches W.